You are at:Home»iPhone»Display»iPhone Keyboard Not Working? Here’s Why & The Real Fix! The keyboard on your iPhone isn’t working properly and you’re not sure why. You’re trying to type out a message or note, but the keyboard isn’t cooperating. In this article, I’ll explain why your iPhone keyboard is not working and show you how to fix the problem for good! Why Isn’t My iPhone Keyboard Working? The app you’re trying to use the iPhone keyboard in has crashed. Your iPhone is experiencing a more advanced software problem. Your iPhone’s display isn’t working properly or has become unresponsive. The steps below will help you identify exactly what has caused your iPhone keyboard to stop working and show you how to fix the problem! Your keyboard may malfunction if something’s stuck on the screen. Often times, this will be food residue — you eat something with your hands, then pick up your iPhone. When you start using your iPhone, some of the food you were just eating gets stuck to the display, tricking your iPhone into thinking that you’re tapping the screen. 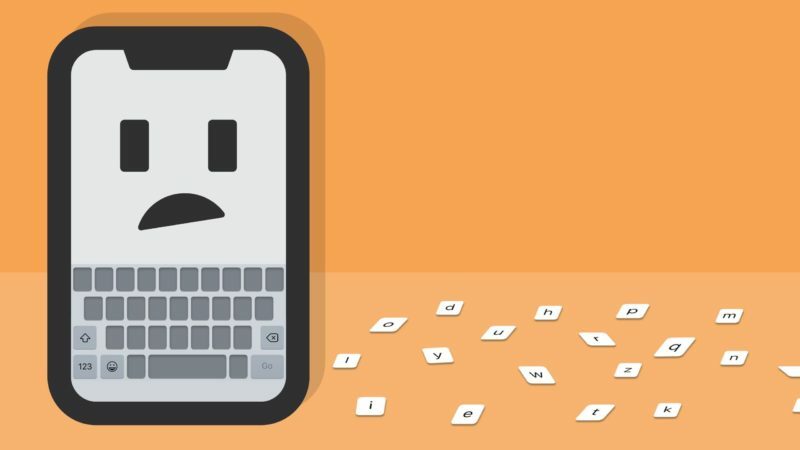 Sometimes, this can cause your keyboard to go crazy and even “type letters on its own.” Grab a microfiber cloth and wipe down the bottom of your iPhone’s display where the keyboard pops up. 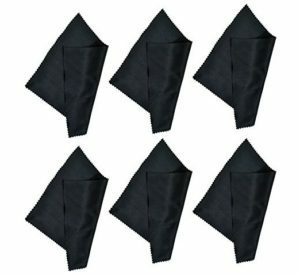 If you don’t have a microfiber cloth, we recommend the Progo 6-pack on Amazon. If the gunk on your screen is really stubborn, you may want to use a screen cleaning liquid. However, you have to be careful here — many popular screen cleaning sprays contain ingredients that can be harmful to your iPhone’s display. Apple advises that you don’t use cleaning liquids such as window cleaners, aerosol sprays, household cleaners, abrasives, ammonia, solvents, or anything containing hydrogen peroxide or acetone. As you can imagine, it can be difficult to track down a liquid cleaning product that doesn’t contain any of these ingredients. Fortunately, we tracked one down for you — the GreatShield Touch Screen Cleaning Kit. This kit also comes with a microfiber cloth and a two-sided cleaning tool, so you can cross three items off your shopping list! Here’s an important question you have to ask yourself — is the iPhone keyboard not working in any of your apps, or does the problem only occur in one of your apps? If the keyboard doesn’t work in any of your apps, it’s less likely that one specific app is causing the problem. If the keyboard won’t work in only one app, there’s a decent chance that app has crashed, which is causing the problem. Regardless of the situation you’re in, let’s close all of the apps on your iPhone. This way, we can be sure that an app crash isn’t what caused your iPhone keyboard to stop working. To close your apps, open up the app switcher by double-pressing the Home button (iPhone 8 and earlier) or swiping up from the very bottom of the screen to the center of the screen (iPhone X). Then, swipe your apps up and off the top of the display. You’ll know all of your apps are closed when nothing appears in the app switcher. Even if you’ve closed all the apps on your iPhone, it’s still possible that your iPhone keyboard is not working because of a minor software problem. Restarting your iPhone can fix small software issues, as it allows all of the programs running on your iPhone to shut down naturally. To turn off your iPhone, press and hold the power button, then swipe the red power icon across the words slide to power off. If you have an iPhone X, press and hold the side button and the volume down button, then turn off your iPhone by swiping the power icon from left to right. To turn your iPhone back on, press and hold the side button (iPhone X) or the power button (iPhone 8 or earlier) until the Apple logo appears on the screen. We often refer to Reset All Settings as a “magic bullet” because it has the potential to fix troublesome software problems that are otherwise difficult to solve. This reset restores everything in the Settings app to factory defaults. You’ll have to reenter your Wi-Fi passwords, set up your wallpaper again, and reconnect to your Bluetooth devices, but it’s worth it to get your iPhone keyboard working again. To reset all the settings on your iPhone, go to Settings -> General -> Reset and tap Reset All Settings. Enter your iPhone passcode, then tap Reset All Settings to confirm. If the Reset All Settings didn’t work to fix your iPhone keyboard problem, it’s time to put your iPhone in DFU mode and restore. 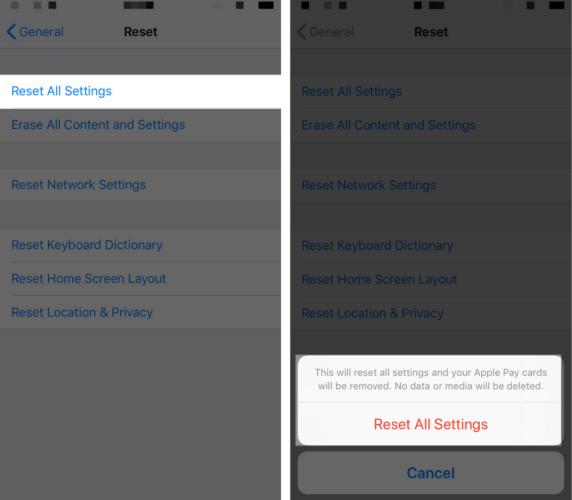 This restore will erase and reload every line of code on your iPhone. When the restore is complete, it will be like you’re taking your iPhone out of its box for the first time. Before putting your iPhone into DFU mode, I strongly recommend saving a backup of all your data and information. That way, you can restore from a backup and not lose all of your photos, videos, and more. This step is a real long shot, but it’s worth trying if it can save yourself a trip to the Apple Store. 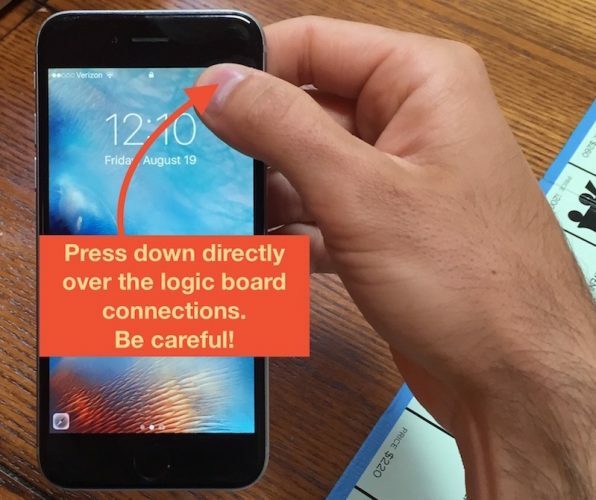 If your iPhone keyboard stopped working after you dropped it on a hard surface, the tiny wires inside your iPhone that connect the logic board to the display may have become dislodged. If they become dislodged, the display can become unresponsive. The location of the logic board will vary depending on which model iPhone you have. We recommend going to iFixit and finding the teardown guide for your model iPhone to learn where to logic board is located. Once you’ve found the logic board, press down directly on it. You’ll have to press down pretty hard, but be careful not to press too hard, because you run the risk of actually cracking the display. However, if your display is already unresponsive, there may be nothing left to lose. If the DFU restore didn’t fix your iPhone keyboard, then we can rule out the possibility of a software problem. Now, it’s time to discuss your repair options. Water damage, cracked screens, or accidental drops can all cause your iPhone’s display to stop working. If the display isn’t working, you’ll have difficulty doing even the simplest tasks on your iPhone, like opening apps or typing on the keyboard. If your iPhone is covered by AppleCare+, head to your local Apple Store and have a technician take a look at it. We also recommend Puls, an on-demand repair company that sends a certified tech straight to you! The keyboard on your iPhone is working again and you can get back to trying messages, emails, and notes! Next time your iPhone keyboard is not working, you’ll know where to come to fix the problem. Let me know which step fixed your iPhone by leaving a comment down below! Previous ArticleInvalid SIM On iPhone? Here’s Why & The Real Fix! Next Article Puls TV Mount Promo Code | Save 10% Using Our Exclusive Coupon Code!